everything is connected to everything else is the essence of ecological epistemology. barry commoner, considered one of the founders of modern environmentalism, outlined 4 laws of ecology in his 1971 classic the closing circle. if you play scrabble you notice there sure are a lot of e's in the game. in english the letter e is the most frequently used letter. one fellow who pointed this out was samuel morse. when he was experimenting around with establishing his system for morse code, sam examined the number of letters in printer's type. he wanted to give the easiest codes to the most frequently used letters (e, by the way, is represented by one dot). (by the way the third column represents proportions - taking the least common letter (q) as equal to 1 - the letter e is over 56 times more common than q in forming individual english words.) now in terms of frequency of letters at the beginning of words, that is a completely different matter - here there are more english words that begin with the letter s than any other letter; how does e fare? well, it's in the middle; the letter which begins the fewest number of words - x.
mercy mercy me (the ecology song) written and performed by the late great marvin gaye, whose life tragically ended in 1984. the song is a poignant environmental anthem, not the type of song one would expect would climb to the top of the pop charts, but that it did soon after it was released in 1971 . Loved Commoner's 5 rules which I didn't know. Kinda wondering about OE & BO in that scrabble game tho! john oe and bo are legit! as diehard scrabble players know two-letter words are scrabble salvation. for those who don't have their cheat sheet, here's this year's official list (with words that can be pluralized) over time the list changes - both additions and deletions. alas DA is no longer on the list, which disappoints me to no end. anyone interested just has to google scrabble two letter list and they will get a slew of info - one site (http://www.yak.net/kablooey/scrabble/2letterwords.html) even provides the meaning of all the odd words. I'd never realized that about Marvin Gaye's song - thanks for the info. We have a saying around these parts which goes "ee by gum" which ruffly translated means "goodness gracious me". Well, ee by gum, that was an interesting post. thanks for the cheat sheet...i had the same reservations as John about those wee words. mum - I can't imagine that there's not similar analyses of french! look forward to your report! tom - for the cheat sheet, you are well, it's indispensable for scrabble players, a few years ago I made laminated bookmarks for all my scrabble-playing buddies - ha! 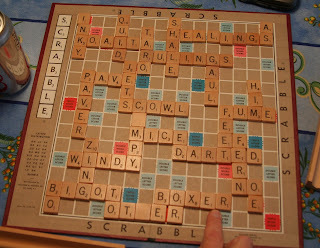 I love scrabble but I had no idea there were so many strategies. I kinda just made words. Liv&learn.. I use scrabble words with 2 letters I started using a new app called 'Cheats and Words' to further assist in my vocabulary and player development.